Say the word, “chocolate,” and I get giddy. Combine it with the word, “Hana,” and I become so elated, I grab my camera and note pad and just about fly out the door at the chance to travel to Maui’s illustrious east end to write about the first “branch-to-bar” cacao farm on the island. Besides being indescribably luxurious on your palate, it lowers blood pressure, boasts antioxidants and caffeine, and inhibits LDL, aka “bad” cholesterol. So it was with great pleasure that I embarked on a press trip with writers from as far away as New York, San Francisco and San Diego to tour Hana Gold cacao farm. Hana Gold is a humble 10-acre working cacao plantation on the Waianapanapa side of town. It produces Maui’s only branch-to-bar chocolate, meaning it’s a single-source, organic producer that uses only cacao nibs from its trees and it takes it from fermentation to the finished product onsite and at a commercial kitchen in South Maui. Led by Aldon Frost, whose family has owned the property for 45 years, the tour is fun as well as educational. As icing on the cake, it ends with tastes of chocolate. You may book the tours directly through Hana Gold, or the concierge at Travaasa Hana will set it up for guests. Frost showcases the process of production from the planting of the trees to the making of the chocolate. 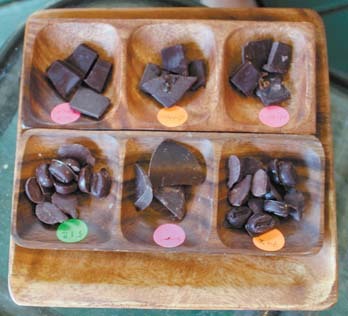 You’ll learn about the history of chocolate in Hawaii and the varieties grown here and around the world. The Frosts have grown cacao for 10 years now. The Frost family is far from the first to grow cacao in Hawaii, but they were at the start of modern-day Maui interest. Its history in Hawaii dates back to 1850, when William Hillebrand planted the first cacao trees on Oahu. 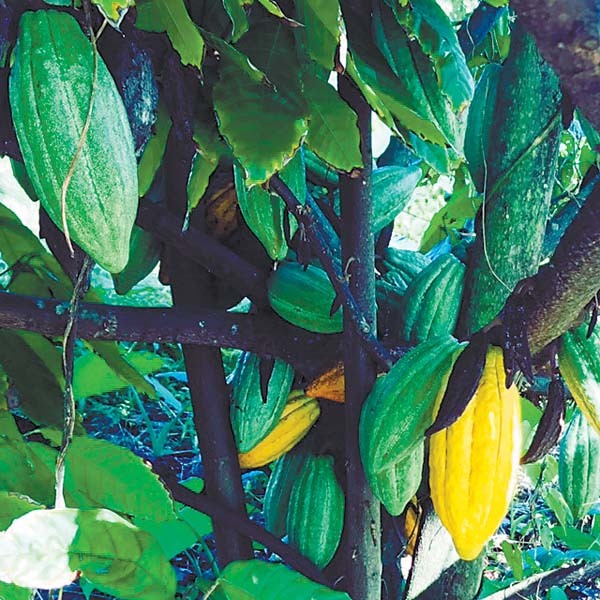 The team of Hitchcock and Crick planted cacao in Hilo in the 1890s, and small experimental plantings continued until World War II when prices plummeted. “It wasn’t until the 1990s that Dole launched a commercial venture on Oahu. 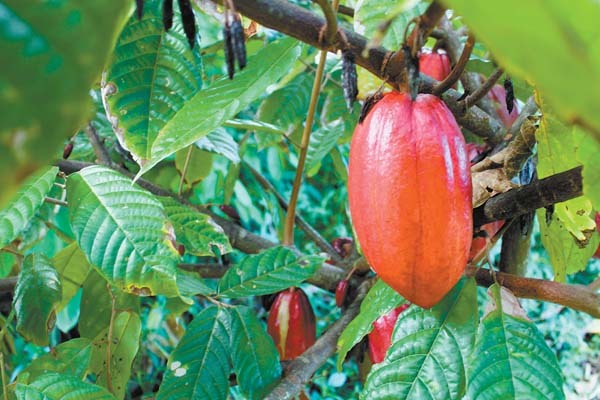 It’s the largest producer in the state,” said Frost as I chewed on a nib and flashed back to the first time that I saw cacao growing in the wild. It was 1989 on equatorial Suluwesi Island in Indonesia. We rode in a rickety bus 10 hours over the “Swiss Alps of Indonesia” from Ujung Pandang city to the magical mountain village of Rantepao. Formerly called the Spice Islands as well as Celebes, Suluwesi was choke with cacao trees as well as nutmeg, cardamom, cinnamon, cloves and saffron drying on mats. Rice paddies were everywhere. The Rantepaons made crazy-good chocolate rice crispies from scratch and baked chocolate-filled croissants with recipes provided by French missionaries. But I digress. Unlike alpine Rantepao, Hana Gold is near sea level. And cacao in Hawaii has evolved much from the 1990s, when Dole went commercial and Bob and Pam Cooper in Kona added a processing plant to their orchard and their Original Hawaiian Chocolate Factory, making 100-percent Hawaiian cacao candies, the first in the state. The Big Island Chocolate Festival, Hawaii Chocolate and Cacao Conference, Taste of Chocolate, tours, and more growers all have come on board, and interest in Hawaii cacao keeps budding like bamboo. In fact, Hawaii is the only state that can grow it as the islands are located within the sweet-spot range from about 21 degrees north and 21 south of the equator. Frost first plants seedlings under tomato cages, which act like jungle canopies imitating branches. Frost also says that his bars are gluten-free, non-GMO and that he uses organic vanilla and sugar and Molokai sea salt as ingredients. 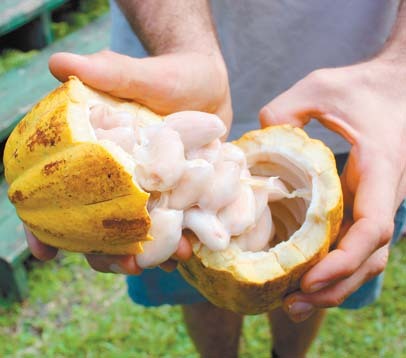 But his cacao is propagated by hand as birds and bees can’t break open the pods to spread the seeds. Frost added that early Meso Americans would propagate cacao so as to eat the nibs as a pre-hunt ritualistic snack. The Mayans also added some nibs to pepper and spices to make an energy tea. Speaking of energy, Frost was animated in his talk as he had been popping nibs into his mouth all day. He then showed the writers how he runs through the whole process from fermentation to making the bars in his small demo hale, or hut. Besides the farm and online, he sells bars at Tamura’s, Down to Earth and Mana Foods. This single-source chocolate is fair trade in that it doesn’t use cacao from countries that exploit child labor. He even makes a jam from “miel,” Spanish for “honey,” a gooey substance encasing the nibs. The jam is yummy spread on English muffins. • Hana Gold tours: Fun adventures are offered Monday through Saturdays by calling the farm. Guests of Travaasa Hana may also book tours through the concierge. Visit www.hanagoldmaui.com or call the resort at 248-8211. 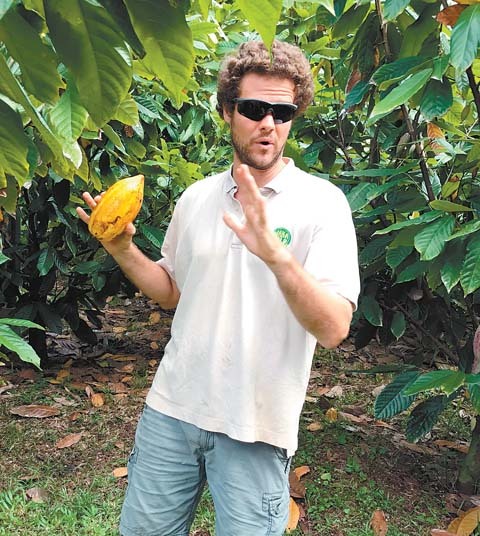 • Conference: Hawaii Chocolate and Cacao Association will hold its annual conference March 10 and 11 on Oahu with farm and factory tours to Waialua Estate, 21 Degrees Estate and Manoa Chocolate. Tickets available starting in January. Visit www.hawaiichocolate.org. 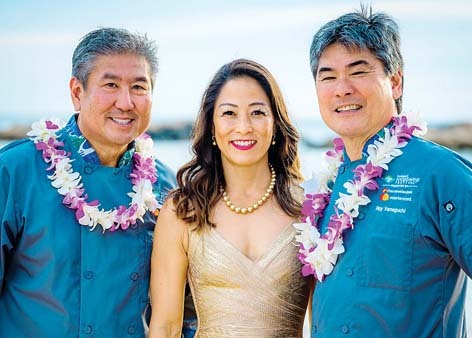 • The Big Island Chocolate Festival: Known as the “yummiest fundraiser of the year,” it will be held April 27 to 28 at Hapuna Beach Prince Hotel on Hawaii Island. 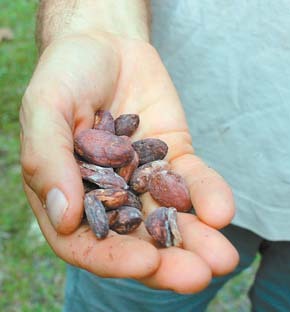 Attend a gala tasting, see demos, tour cacao farms. For tickets, visit www. bigislandchocolatefestival.com/tickets. 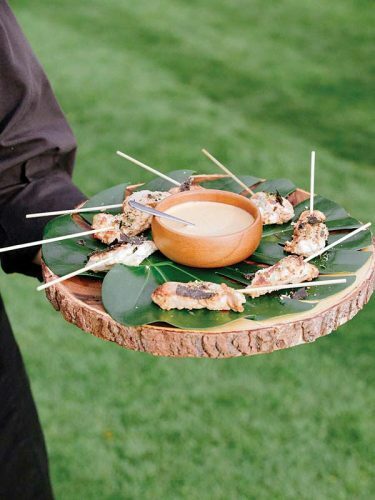 • Taste of Chocolate: This fan favorite at the star-studded Maui Film Festival in Wailea is scheduled for June 15 at Four Seasons Resort Maui with fine desserts and drinks galore. Visit www.mauifilmfestival.com.